← Those Aren’t Home Improvement Tools – These Are! Having a fragmented filesystem or partition is never good news for your system and may be undetected and uncured for day, weeks, or months resulting in loss of productivity since your computer is operating at a less than 100% efficiency. In this article we take a closer look at fragmentation and a few tips to resolve them. If we created a file with a size of 100 MB followed by another that was 60, and finally another 100 MB file. The layout will look like Diagram 1. 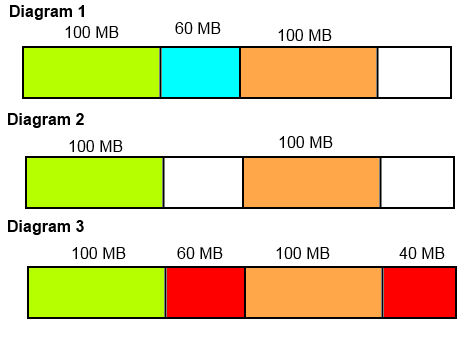 The first file is the one in green, the second is blue, and the third is orange followed by free space. However, what would happen if we deleted that second file and replaced it with a file of 100 MB? Well, deleting it would cause a gap of 60 MB between the first and third file and when the new files comes in, it would be divided in two with 60 MB before the file in orange and 40 MB in the free space after the orange file. The end result is that the file in red has not been saved in one block rather distributed across the disk, that means it is fragmented. Before we discuss this point, it is important to know how these files are read, processed, and updated(written). Most applications will communicate with the file directly through the hard drive, the operating system will need to consolidate the whole file in the memory which then the application communicates with. That being said, if the file is distributed and broken up across the drive, it will have to collect piece by piece before it can use that file which will take a greater amount of time than if the file was all in one place. In conclusion, it will reduce both the read and write speeds of your system. For example, saving a 30 megabyte (MB) Microsoft Word document may take three seconds to an unfragmented disk, but as much as 46 seconds to an extremely fragmented disk. Another side-effect is most operating systems may use virtual memory (also known as “swap,” “disk caching” or “paging”) to temporarily store files that would otherwise use random access memory (RAM). If the virtual memory space is fragmented, the operating system itself can slow down. To resolve the side effects and avoid the problems fragmentation in the first place, you will a disk defragmenter which will organize and rearrange the data on your hard disk to make the files all stored sequentially and in one place which will improve the efficiency of your system and will make you more productive as you wait less for your operating system and application respond to your instructions. An important point to keep in consideration is that most disk defragmenters do not run in the background except for a handful like diskeeper and perfectdisk which I both highly recommend, that means you will need to run them manually or set up a schedule to have them run automatically every week or month. This entry was posted in Linux, Technology, Windows and tagged Defragmentation, filesystem, fragmentation, partition. Bookmark the permalink.